The new headquarters for DaVita is moving along quickly. The Fortune 500 Company will have over 270,000 square feet of office space and intends to employ about 900 employees in the new building. 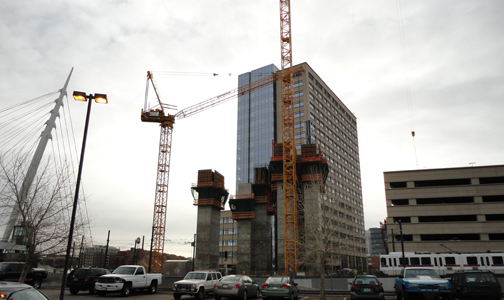 Last week a second crane was added and the elevator shafts are swiftly going vertical. Everyday I’m amazed at the progress. Its expected construction will be complete and the company can move into their new headquarters sometime in 2012!